The holidays can creep up fast and it's easy to lose track of time. This year, do yourself a favour and plan your holiday party now with plenty of time to spare. It can take a lot of hard work to make your party a fun, memorable experience for everyone. 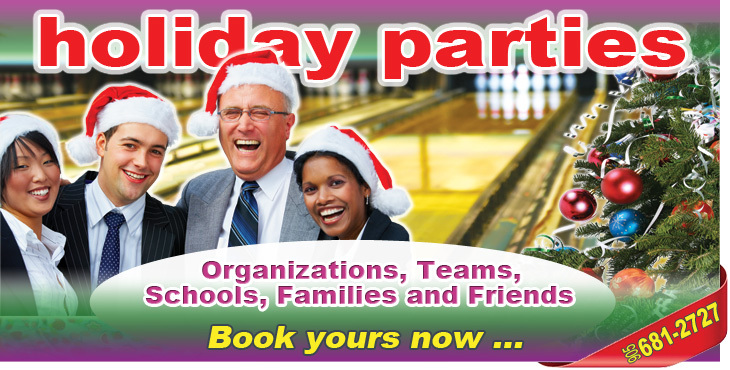 This year, why not have your event at Burlington Bowl and leave the work to us! Get the ball rolling on your event and let us build a custom package tailored to your budget, from small and simple to large and extravagent. Our dedicated party staff handles the details so you can relax and enjoy the party. With bowling, great food, and spacious party room, there's something for everyone. Just call us at 905-681-2727 or fill out the form to the right, and we'll work with you to set everything up from start to finish - including planning your dinner menus, drink options and activities. Bowling in Burlington, Oakville, Milton, Hamilton & Mississauga. © Burlington Bowl. All rights reserved.